I’m someone who grew up with gaming in the late 90s, a time where properties such as Pac-Man were snuffed out by the likes of Mario, in his low-poly, 3D goodness. I never thought I would find the appeal of playing a game based on the pizza-shaped quarter-destroyer, at least, that’s what I thought, until the release of the original Pac-Man Championship Edition on Xbox Live Arcade in 2007. 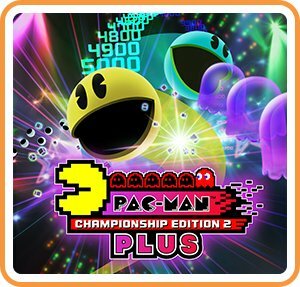 Pac-Man Championship Edition 2 Plus (Switch) – image for this review provided by Bandai Namco Entertainment. I instantly fell in love with the fast-paced, 80s, Tron-inspired aesthetics of the game, so naturally, I was excited to check out Pac-Man Championship Edition 2 Plus on the Nintendo Switch. Initially released in 2016 for the PlayStation 4, Xbox One and Windows PC, Pac-Man Championship Edition 2 has landed on the Nintendo Switch, bringing with it an all new Plus mode, which introduces a co-op multiplayer Pac-Man experience to the already frantic game. Everything from the base version of Championship Edition 2 is available in the Switch release. Those unfamiliar with the series will be happy to know that the game offers a tutorial mode, in addition to a Score Attack and Adventure mode option. Unlike classic Pac-Man, Championship Edition 2 gives Pac-Man a bit more wiggle room when it comes to getting hit by a ghost. Instead of instantly losing a life, the player can afford up to three hits, with the second hit causing the enemy to become aggroed and potentially deadly. 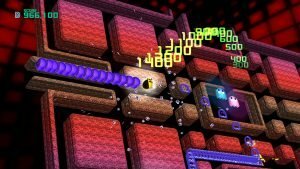 If you do find yourself in a precarious situation, Championship Edition 2 gives players plenty of bombs that help Pac-Man jump from his current position on any given map to a safer location within the maze. Additional bombs can sometimes be earned by collecting all the dots on a given map. Additionally, each maze or layer within a level will have dormant, or sleeping ghosts that only awaken when the player runs past it, joining the ever-growing snake of ghosts chasing Pac-Man. 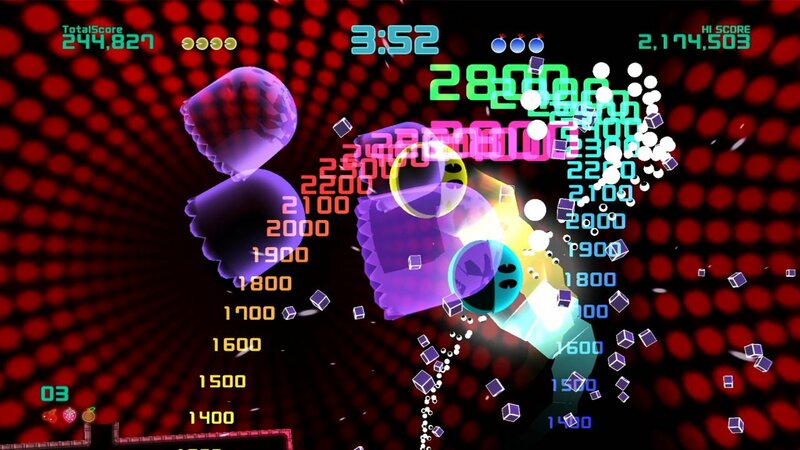 In Score Attack mode, the player will have a set amount of time to get as many points as possible, by quickly clearing maps and diving deeper into the endless labyrinth. To advance, players must collect enough points or dots, until a piece of fruit appears in the middle of the map, upon eating the fruit, the map refreshes and the game continues. Occasionally, a Power Pellet will take the place of a piece of fruit or candy. Power Pellets, in classic Pac-Man fashion, turn the ghost enemies blue, allowing the player to chew them up in a cool 3D sequence. Unfortunately, this is also where the Nintendo Switch version of the game suffers from some noticeable framerate drops (especially in multiplayer). 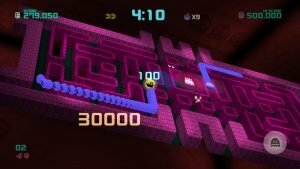 For players that like more objective based games, Namco Bandai has included an Adventure Mode within Pac-Man Championship Edition 2 Plus. The Adventure mode gives players over a dozen levels spread across two worlds with varying difficulty ratings. The levels themselves consist of clearing out a handful of mazes within a set amount of time and limited lives. 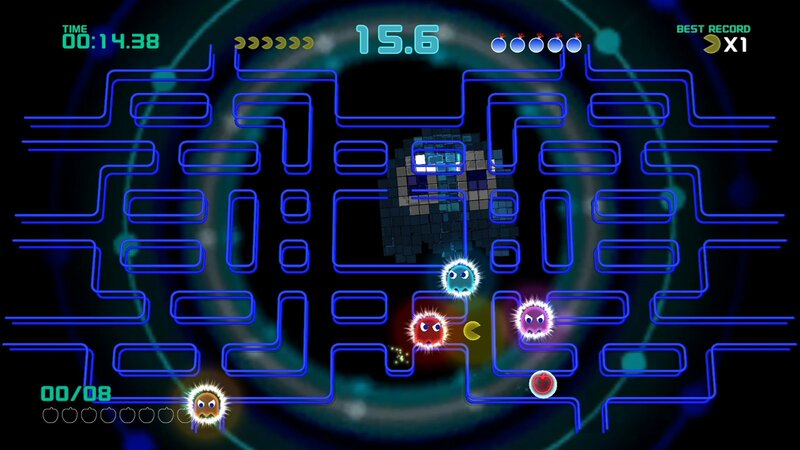 After completing a set of levels, Pac-Man must face an end-level boss. 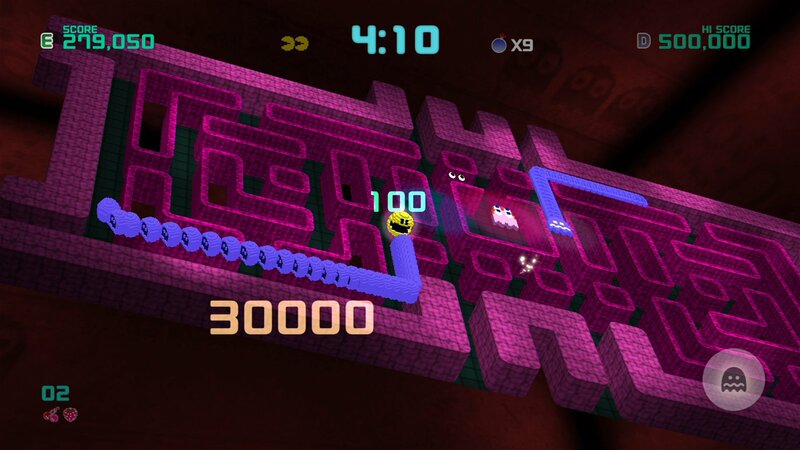 Bosses are defeated once the player completes a set of mini-mazes, culminating in a voxel-based cutscene that shows Pac-Man defeating the end-level ghost. Ultimately, Boss encounters feel a bit flat, with most of the fight done automatically for the player. Boss encounters are more fleshed out within the two-player Plus mode of Pac-Man Championship Edition 2. Both players are locked in a tiny arena in which they need to quickly gather points to initiate a damage phase for the boss. Dealing damage consists of both players hurling themselves towards the towering ghost, mashing the jump button to zig-zag and ricochet off walls, akin to a game of pinball. Plus mode forgoes adventure/objective based levels, giving players access to just the Score Attack and Tutorial modes. Score Attack is similar to single-play but the addition of a second player (which can be controlled by the computer for solo sessions), changes up the basic gameplay considerably. Instead of being able to advance the multi-layered mazes in a level by collecting a piece of fruit, candy or power-up, both players must kiss each other to trigger the level to shift. Ghosts that turn blue also need to be sandwiched between both players to be squashed (with the power of love). 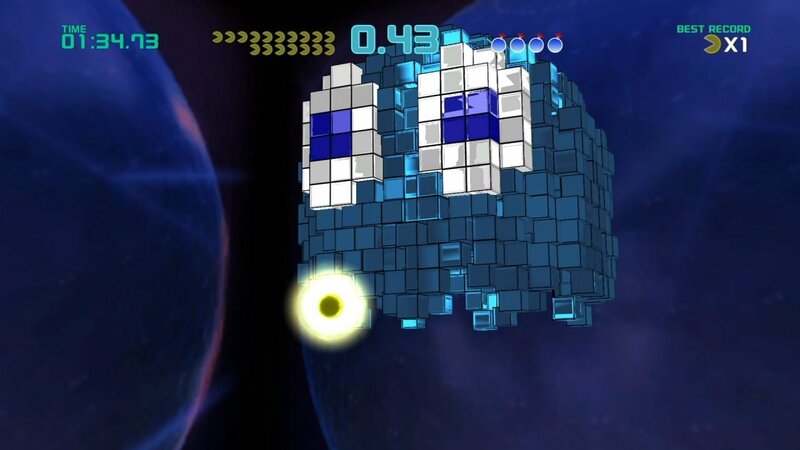 A large chain of blue ghost enemies makes for a satisfying finish when both players are in sync and have successfully trapped and lined up the finishing blow(kiss). Multiplayer also allows players to save each other if they happen to get caught by an enemy ghost, as long as they can make it in time before a small energy bar depletes. If I had to pick the two standout aspects of Championship Edition 2 Plus, it would have to be the stellar art direction and the catchy electronic music that help elevate the game, keeping it feeling contemporary. The title also gives players access to a plethora of skins, map styles, colours and even camera angles that can drastically change the look of a level. Skins for both Pac-Man and the Ghosts include different variations of the iconic characters, borrowed from the long and storied history of the beloved franchise. Pac-Man Championship Edition 2 Plus for the Nintendo Switch is a port that just makes sense on a console that encourages local multiplayer. Aside from a few snags such as inconsistent framerates and luke-warm boss encounters, Pac-Man Championship Edition 2 Plus is a good game and worthy of the Pac-Man legacy. Pac-man Championship Edition 2 Plus keeps all the fun and frenetic gameplay that made the original so appealing, a inconsistent frame rate holds back the otherwise great package that shouldn't be missed.